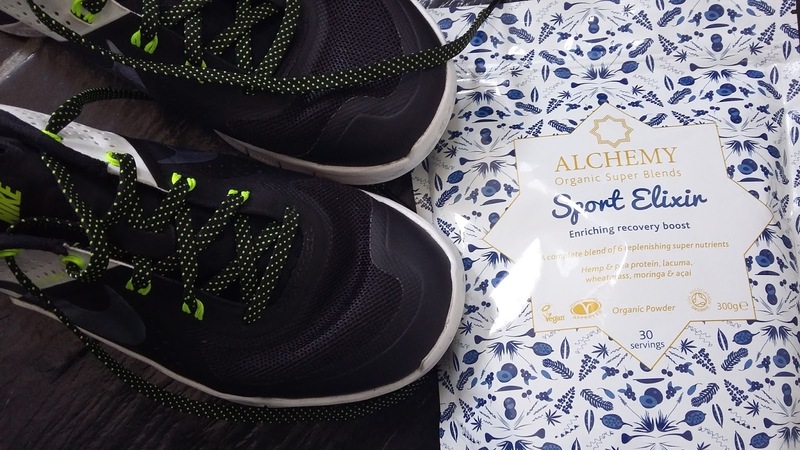 Alchemy Organic Super Blends Sport Elixir is a blend of six plant-based nutrients designed to aid recovery after sport. The idea behind it is convenience. 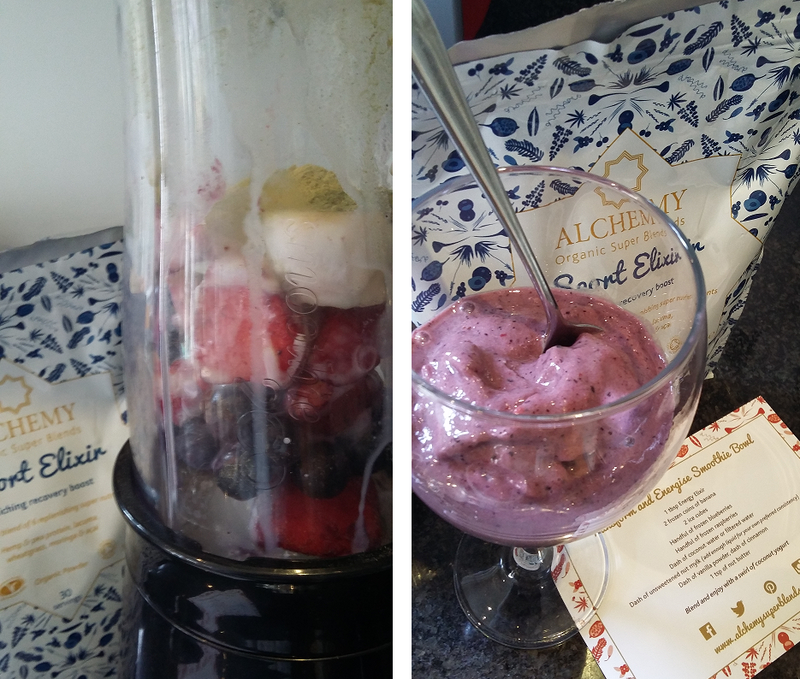 Rather than rifling through our cupboards, struggling to find healthy options to add to our meals, a few scoopfuls of Alchemy will give us all the nutrients we need. 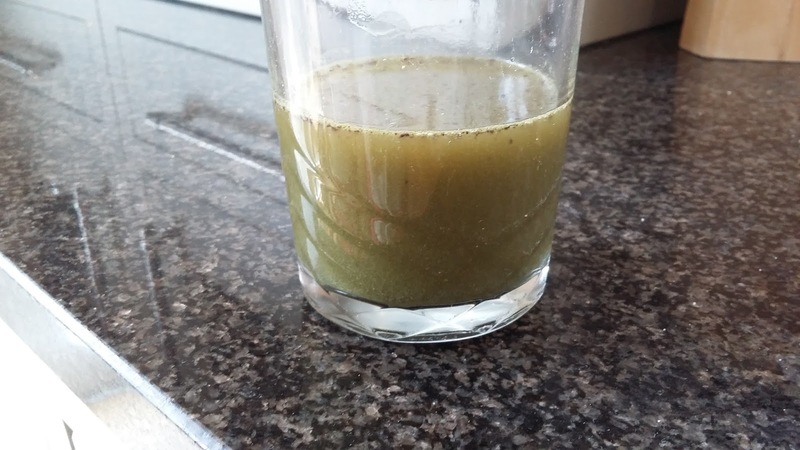 The Sports Elixir is a blend of organic hemp and pea protein, lacuma, wheatgrass, moringa and acai. It is Soil Association, Vegan Society and Vegetarian Society approved, and the ingredients are free of fillers, flavours, preservatives, sugar and stevia. Add 2-4 heaped teaspoons to water, juice or favourite smoothie after exercise. Each 10g serving provides 32kcal, 3.5g protein, 2.4g carbs (of which 0.9g sugars), and 0.7g fat (of which 0.1g is saturated). I experimented a bit, adding spoonfuls to various different foods to see what works best (for me). Without doubt it’s the smoothie option that does. 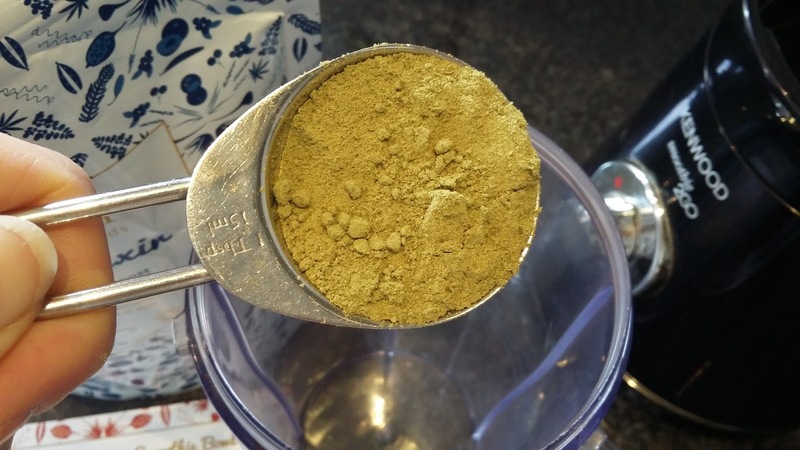 The powder is pea green in colour and has a fairly strong leafy smell. First I tried adding it to a glass of water. It mixed well with a bit of stirring but I didn’t particularly like the taste. It wasn’t unpleasant; it was just a bit too wholesome for my likig (these things are personal). Next up I tried the smoothie option. Yep, this was more like it! I got sent a couple of recipes with the sample bag, ‘Get up and go’ and ‘Transform and Energise Smoothie Bowl’. The first is a vegetable smoothie and the second fruit. Being of sweet tooth, I opted for the latter. It is totally delicious! I’ve included the recipe for you below. Quick tip: I would add the elixir powder at the end (I found it mixed better in my rather basic smoothie maker, though a NutriBullet would probably handle it no problem). I added quite a bit more milk (about 100ml) as the mixture was very thick, though consistency is down to personal taste. 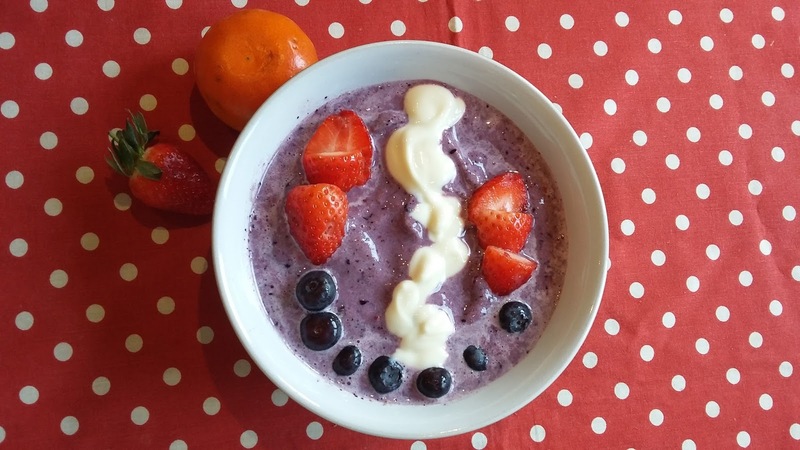 My fruit mixture was blueberries and strawberries as I couldn’t find raspberries – it worked just fine, though use raspberries if you can as the taste is better. 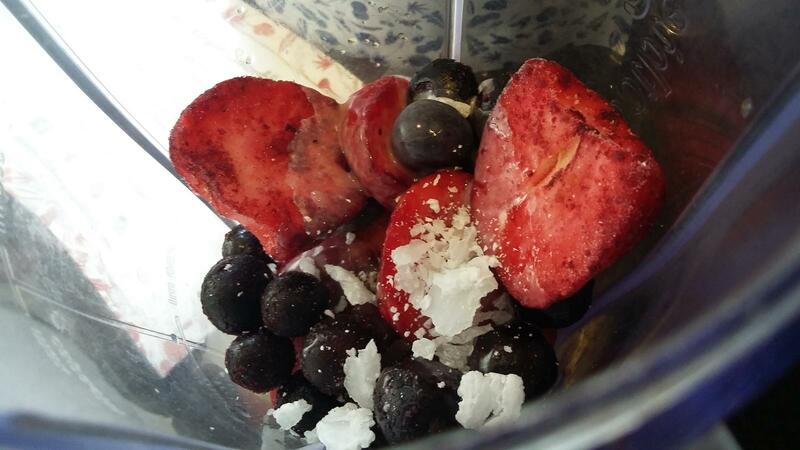 Also, for a change, try omitting the ice cubes and using fresh fruits (except banana which needs to be frozen). This creates a milky smoothie with a fruitier flavour, though frozen fruits and ice cubes are just perfect for hot Summer days! Organic Super Blends come in four different varieties: Sport, Morning, Beauty and Energy. They cost £40 for a 300g bag (30 servings) and can be bought here. What an interesting product! 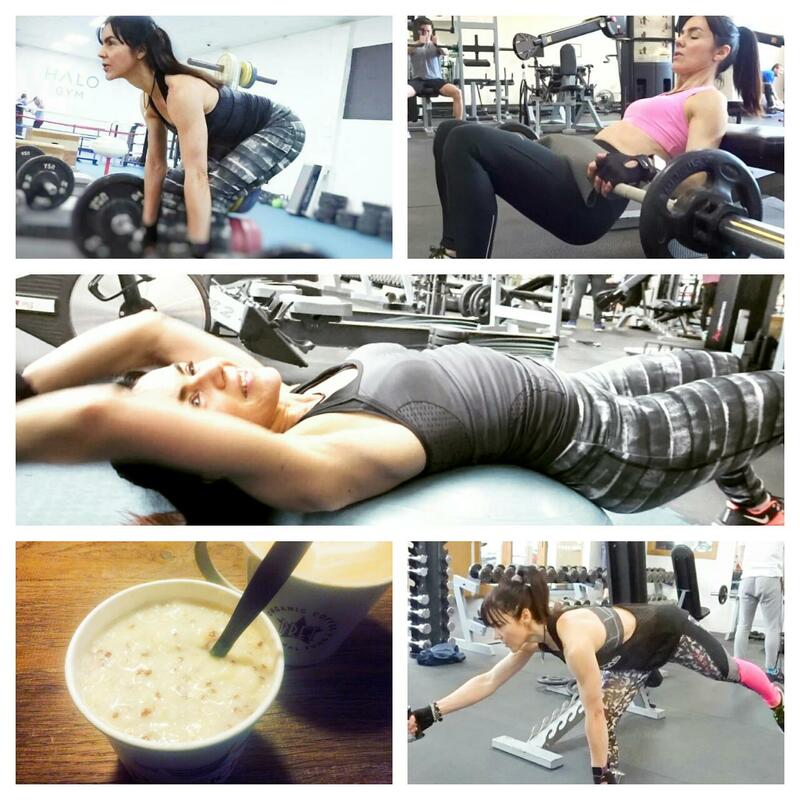 I'm always keen to get some protein after exercise. On its own it doesn't look at all appetizing but hidden in food, clever way to use it! Have to say that Smoothie looks delicious, love all those fruits. Selicious!!! I would love to try this at home. After a long workout, your body needs nutrients to replenish what it has lost, and nothing could be handier or more nutritious than the right smoothie. Smoothies are perfect because you can pack so many servings of the right nutrients into a drink that’s quick to make and easy to digest.